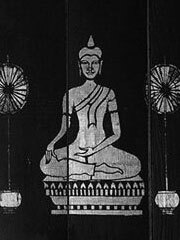 Satipatthana refers to the broad conception of Buddhist meditation in the Theravada Buddhist tradition. It is often called the Four Foundations of Mindfulness, namely, mindfulness of the body, of thoughts or the mind, of feelings and of mental objects or qualities. These are also known as the «four frames of reference» or Satipatthana-samyutta. Satipatthana can also be thought of as «establishing mindfulness» or sati-upatthana. Satipatthana is a way of implementing the right mindfulness and, less directly, the right concentration parts of the Noble Eightfold Path. Satipatthana meditation goes hand-in-hand with vipassana, samatha or calming meditation, and anapana meditation. Satipatthana is practiced with the aims of vipassana and most often in the context of Theravada Buddhism although the principles are also practiced in most traditions of Buddhism which emphasize meditation such as the Zen or Soto Zen tradition. There is also a Satipatthana sutta or sutra which is also known as the Discourse on the Foundations of Mindfulness. This sutta explains how to systematically cultivate mindful awareness or sati.